I’ve always had a soft spot for Yeti (the abominable snowman), Sasquatch (“wild man of the woods”), the Loch Ness monster, and other folklorish creatures that dreamy people think are real. And thus I was delighted when the Scottish serpent was spotted on holiday in Brooklyn of all places. 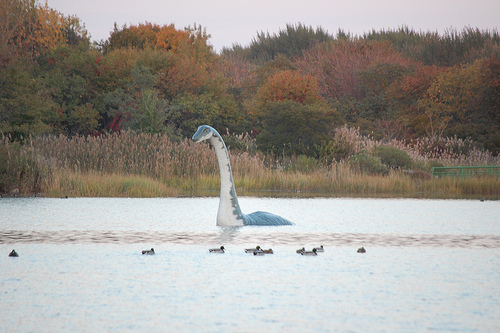 Artist Cameron Gainer installed the 12.5-foot-tall Nessie in the salt marsh off Marine Park. I’ve watched Nessie grow up, because Cameron built the serpent in my friend Matt’s synagogue. New Yorkers in need of a nature fix should check out the improbable visitor. Rumor has it (and I won’t deny it) that I slipped information about the Loch Ness monster into my book King’s Gambit.